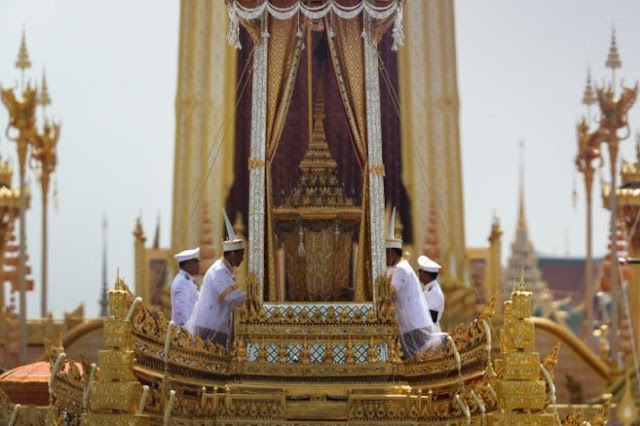 The Great Victory Chariot carrying the royal urn of Thailand's late King Bhumibol Adulyadej is pictured during the royal cremation ceremony near the Grand Palace in Bangkok , Thailand, October 26, 2017. BANGKOK - A woman’s 750-km (470-mile) trek to see the late Thai king’s cremation ceremony was only one example of the level of religious devotion on display in Thailand on Thursday. Thailand’s semi-divine “father” was idolized like no other modern monarch. A year of mourning has done nothing to diminish that veneration as Thailand marks a final end to his era with his cremation, uncertain of what is to follow. “I have walked a long way until all my toe-nails have fallen off,” said 61-year-old Montha Suchit, who set off in mid-September from Nakhon Si Thammarat in southern Thailand. “This is the least we can do to repay him,” she told Reuters as she waited, clad in black like most of Thailand, for King Bhumibol Adulyadej’s funeral procession to pass by. Thousands spent days camped on torn cardboard boxes to secure a spot near the procession with only plastic sheets for protection from intermittent monsoon rain and tropical sun. “He was the lifeblood of the nation,” said Sorana Theppanao, 60, who counted himself lucky to have got a place near the procession by sleeping out for three days. King Bhumibol developed a very personal following with hikes to remote villages and an emphasis on helping the poor despite the royal family’s immense wealth. He cultivated an image of being above coups and protests while intervening in times of crisis. The royal image was enhanced by a well-funded public relations apparatus. It was also protected by laws that meant anyone insulting it could get a long jail sentence. “The circumstances and propaganda were crucial, but the individual made it all work the way it did, and hence the Thais’ deeply emotional final farewell,” said Thitinan Pongsudhirak of Chulalongkorn University. Some mourners questioned whether the king would have wanted such an ostentatious sendoff, for which $90 million was budgeted. Upstream of Bangkok, some districts were left flooded after heavy rains so waters could not disrupt the spectacle. “We all came out to thank the king personally, so in that sense the extravagance was not needed and does not reflect the late king’s attitude,” said 70 year-old Tip Boonmak. As the procession passed, mourners dropped to their knees, many still holding up mobile phones to record the scene. “This is the last day we meet him before he goes to heaven,” said Kannika Kamsikeaw, 39. For foreign visitors, the emotion was hard to comprehend. More than 95 percent of Thais were born during King Bhumibol’s reign, marked by economic transformation and political turbulence through which he was a stabilising figure. King Maha Vajiralongkorn, who has succeeded his father, does not have the same following. Recently, he has spent much of his time in Germany, where his son is at school. Asserting his new power, he has required changes to the constitution and taken personal control of the palace’s financial holdings. Besides drawing a line under King Bhumibol’s era, the cremation is a step towards the military government’s promised revival of politics and an election next year. For more than a decade, politics in Thailand was torn between ‘yellow shirts’ - royalists dressed in the king’s color - and ‘red shirts’, who backed a populist movement whose governments were twice overthrown by the army. But any animosities were hidden on Thursday on the streets of Bangkok. A woman’s 750-km (470-mile) trek to see the late Thai king’s cremation ceremony was only one example of the level of religious devotion on display in Thailand on Thursday. Thailand’s semi-divine “father” was idolized like no other modern monarch. A year of mourning has done nothing to diminish that veneration as Thailand marks a final end to his era with his cremation, uncertain of what is to follow.